Final week of “Angles & Energy” at La Playa Gallery in La Jolla Shores, California. A view of “Fractal #49” | Montana Cans (official) and Liquitex Artist Materials on Artist & Craftsman Supply – Official Fan Page birch panel with UV varnish | 12″ x 12″ x 1.5″. 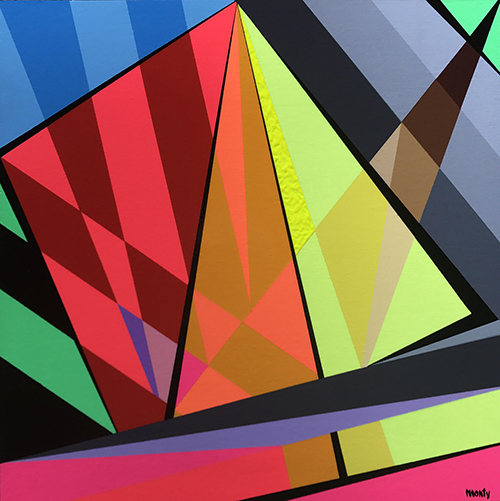 Work of Art statement: The “Fractal Series” is a series of works that are based on line, shape, energy, and color relationships found in Nature. “Fractal #49″ | Montana Gold aerosol and Liquitex acrylic on birch panel with UV varnish | 12″ x 12″ x 1.5”.